A light weight 450mm diameter powder coated basket ball ring complete with all-weather net. We recommend this is only used in supervised areas. An official sized basketball hoop perfect for practicing your slam dunks and seeing how many times you can score. The hoop and back plate are powered coated red and is supplied with an all weather net to hook into place. The back plate is 12cm x 10cm and comes with pre drilled holes. 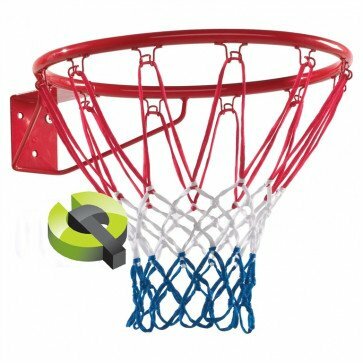 You're reviewing: KBT Basketball Ring Powered Coated Red Complete With Net.